The story of Samuel begins with Hannah feeling sad that she does not have a child. The next time they went to the tabernacle, her husband gave her a double portion to offer to the Lord. There Hannah “poured out her soul,” asking the Lord to give her a son. In return, she would give the boy to the Lord. The Lord answered her prayer, and Hannah named her baby “Samuel” because she asked the Lord for him (see 1 Samuel 1: 1-20). This and other stories in the Word picture a married couple yearning for a child and their joy when the Lord blessed them in this way. As promised, Hannah took Samuel to the tabernacle when he was a little older. Samuel served the Lord there and became a great judge who helped his people follow the Lord. Every child is a potential angel with a unique contribution to make here on earth and in heaven. 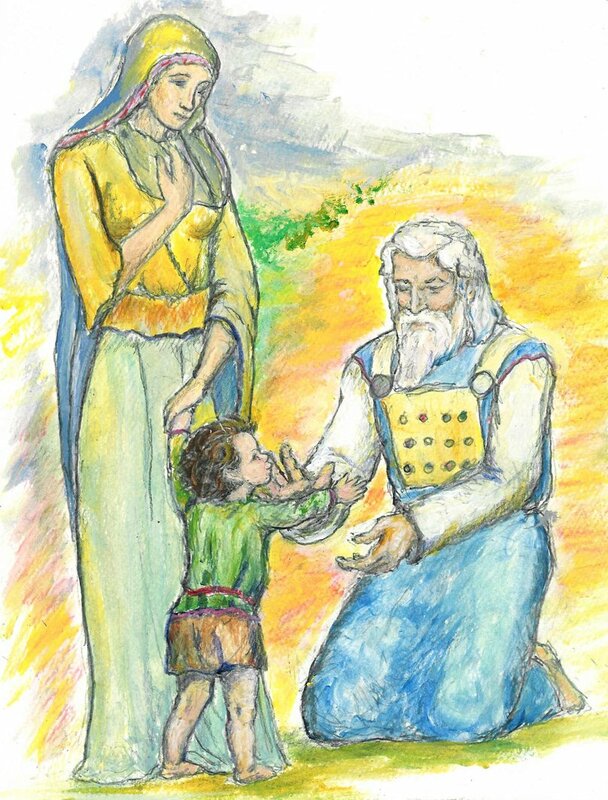 The Lord blesses parents by “loaning” them children to love and nurture. In the process, parents have many opportunities to grow closer together, strengthening their marriage. Read (or retell) the story of Hannah and the birth of Samuel (1 Samuel 1). A simple, reverent retelling of the birth of Samuel and how the Lord called him as a young child. Ideas for reading and discussing the story of Samuel’s birth. Samuel became the last of the judges the Lord called to help the children of Israel. Later, the Lord told him to anoint Kings Saul and David. What are some of the blessings that children can bring to a married couple? Nurturing children together can help parents grow—individually and in the marriage—as each brings insights and strengths to the use of parenting. A love of little children is forever conjoined with true marriage love (Conjugial Love 385). Sometimes children come into a family through adoption, the Lord leading a child in need of parents and parents who want a child to become a family. A family talk about the meaning of the name "Samuel" and the importance of prayer. Illustrate the story by sliding baby Samuel from the Lord to Hannah, and then back to the Lord. Use a sock or handkerchief to make a simple doll. Children can pretend that this is baby Samuel and retell the story. Color the picture of a mother and father holding their baby and being so thankful that the Lord has blessed them with this child! Make a chain of hearts to illustrate the love that flows from the Lord to a husband and wife and on to their children. Pairs a photo of parents with their baby with the quotation from Psalm 127:3.